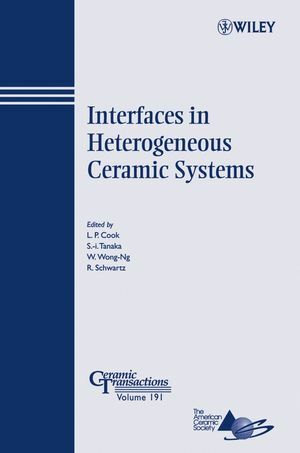 This book provides a state-of-the-art collection of recent papers on interfaces in heterogeneous ceramic systems presented at the 6th Pacific Rim Conference on Ceramic and Glass Technology (PacRim 6) in September of 2005 in Maui, Hawaii. The book is logically divided into 5 sections on interfaces, including theory and modeling, wetting phenomena, heterogeneous interfaces in high-temperature superconductors, bio-interfaces, and new developments in instrumentation that aid in the characterization of interfaces. Lawrence Cook is a research chemist in the Ceramics Division of the National Institute of Standards and Technology (NIST), Gaithersburg, MD. He received his undergraduate degree from Princeton University, a Master's degree from the University of Texas at Austin, and a Ph.D. degree from Harvard University. He completed post-doctoral studies at the University of Indiana. His current research areas include thermodynamics and kinetics of thin-film materials, as applied to electronic packaging, gate-stack dielectrics, and hydrogen storage. He is the leader of the project "Nanocalorimetry: Interfacial Thermochemistry at the Nanoscale". He received Bronze Medals from the US Department of Commerce in 1981 and 2002. He has more than 150 publications, and has served as chief editor or co-editor of three volumes of the ACerS "Phase Diagrams for Ceramists" series. Winnie Wong Ng is a staff chemist in the Ceramics Division of NIST. She received a B. Sc. degree from the Chinese University of Hong Kong, followed by a Ph.D. degree in Inorganic Chemistry from Louisiana State University. Her post-doctoral research was completed at the University of Toronto, Canada. Her main research areas at NIST have been x ray crystallography, phase equilibria, and crystal chemistry of technologically important high-temperature materials, in both bulk and film forms. Currently she is the leader of the project "Advanced Materials for Energy Applications". She serves as the chair of the Electronics Division of the American Ceramic Society (ACerS) from 2005-2006. She is a fellow of ACerS and International Centre for diffraction Data (ICDD). She received a Bronze Medal from the US Department of Commerce in 2002, and the 2004 McMurdie Award from ICDD. She has more than 250 publications. Dr. Robert Schwartz is a Professor of Materials Science & Engineering and Associate Chair for Graduate Programs at the University of Missouri – Rolla. Dr. Schwartz conducts research on piezoelectric composites, dielectric materials, and the chemical synthesis of electronic materials. Dr. Schwartz was previously employed as Associate and Assistant Professor of Materials Science & Engineering at Clemson University from 1997 through 2002, as a Senior Member of the Technical Staff at Sandia National Laboratories from 1989 through 1997, and as a Research Engineer at BFGoodrich from 1980 through 1984. Dr. Schwartz received his B.S. degree in science education and his M.S. degree in chemistry, both from North Carolina State University. He received his Ph.D. in ceramic engineering from the University of Illinois, Urbana, Illinois, in 1989. Dr. Schwartz is the holder of two patents, has published approximately 90 papers, and has written five book chapters.